Falooda is a sweet, cold beverage assembled with many ingredients & is very popular in South Asia. There are many variants of falooda in different countries. Falooda is originally a Persian dessert known by the name ‘faloodeh.’ It was introduced in India by the Mughals. Though this cooling dessert is prepared in summer as the ingredients used to prepare it helps to cool the body but can be enjoyed throughout the year as the flavors are very sweetly aromatic & soothing. 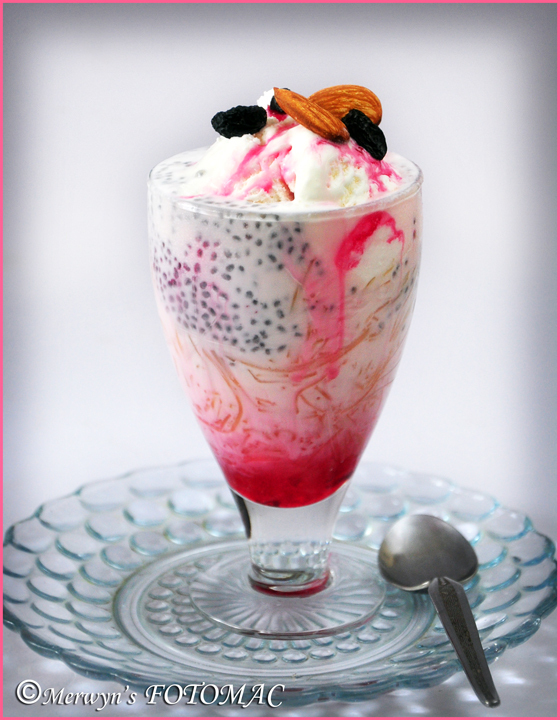 Above all the assembled falooda looks very elegant, strikingly attractive, pleasing to the eye & irresistible! The moment you see the ravishing falooda ice cream in a tall glass you not only crave for it but just want to relish it! To cool slightly thickened milk stir in sugar & rose essence. In individual tall/sundae glasses, first layer 2 tbsps. of concentrated rose syrup. Then layer about 3 tbsps. falooda sev/vermicelli. Next layer 2 tbsps. sabja seeds. Gently add a cup of sweetened milk. Make sure the layers are not disturbed. Lastly place a large scoop of vanilla ice cream. Top with rose syrup & garnish with dry fruits. Hi Hilda, I have never tried making Faloodah at home but have eaten this many a times and everytime I love it's unique colorful flavour..bookmarked! Visited you frm KKKMKT page :)!